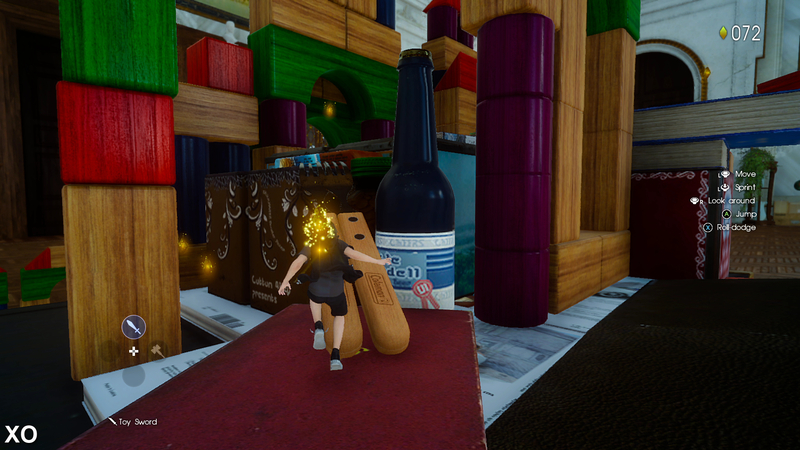 Square Enix's surreal taster assessed on PS4 or Xbox One. After a decade of on-and-off development, the end is in sight for Final Fantasy 15. Across multiple setbacks, changes in production personnel, and one name change, Square Enix now lays down the gauntlet with a firm September 30th launch date, and a brand new 'Platinum' demo for public perusal. This surreal 20-minute taster is entirely separate to the main game, but handily guides us through the technology of the final product - with the Luminous Studio engine in its latest form - where change is afoot on PlayStation 4 and Xbox One. The intent of this demo is quite different to last year's Episode Duscae. 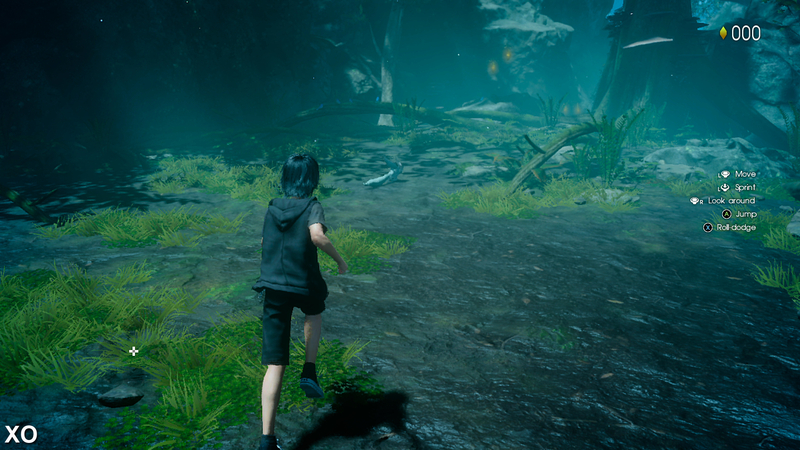 Gone are the gargantuan environments to explore, and instead, this Platinum demo instead dots out a linear path to show off the lighting tricks under its engine's hood. By letting players jump on giant, interactive buttons strewn across each area, we can accelerate its day-night cycle or weather, meaning no two playthroughs look quite the same. 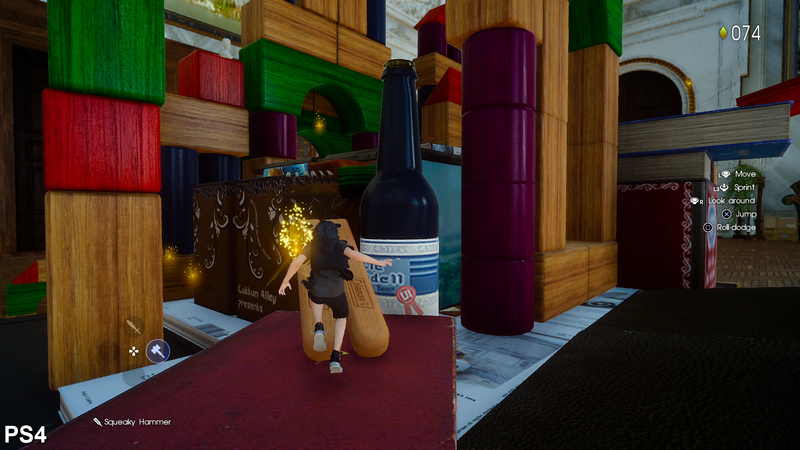 From the lush opening forest area to a gleaming city concourse, the entire affair is gorgeously lit, and fully dynamic - and these switches make the most of a physically-based rendering technique to produce truer-to-life results on each material. By light of day, cloud simulation also radically alters the way shadows diffuse across the scene. As with Episode Duscae, it's a randomised variable that softens and sharpens floor shadows based on the position of rolling clouds. In piecing our comparison video together, this made matching up PS4 and Xbox One shots a very tricky process indeed. Even with time of day perfectly synced between each format, it causes some scenes to differ in hue - with the game's global illumination also factoring in to create varying results. Viewed at night, the two consoles can also look beautiful, and the way the city's lamp-lights bounce off its rain-soaked floors is a real visual high point of the demo. Working around its variables in weather, both PS4 and Xbox One are equals in shadow quality, texture mapping, and lighting - each producing the same quality high dynamic range and light shafts. There is a difference between the two in effects, however; Xbox One visibly reduces the density of GPU-accelerated particles that burst outwards from activated buttons. It's notably pared back in this area, though curiously, PS4 and Xbox One offer matching effect levels in battle - with no cutbacks at all when casting fire spells or on melee strikes. Tom's all-in-one comparison of Final Fantasy 15: Platinum Demo on PlayStation 4 and Xbox One - where the main dividing points are in resolution and frame-rate. The unusual difference in particle effects is also illustrated. Barring the game's excessive black levels at points (which, as with Episode Duscae, engulfs areas with little lamp-lighting in blinding darkness), it's clear why Square Enix is so keen to put lighting front and centre in this demo. Six months to release, and the engine's trump card is very much at the forefront. However, for all the good this demo does to highlight the game's excellence in this field, it also underlines issues that persist from the last demo. Let's talk image quality. On PS4 and Xbox One, we now have a fully dynamic framebuffer in this Platinum demo, rather than the fixed resolutions used previously. This means PS4 typically still runs at 900p, but can rise to a full 1080p if the rendering load is lightened - as spotted during a run down a simple hallway. On the other hand, Sony's machine is now prone to dips under its original value, and engaging the demo's final boss flags a slightly lesser 1568 x 882 reading. We've yet to see PS4's pixel output go any lower, though we can't rule out the possibility in the final game, where the engine could be pushed harder. 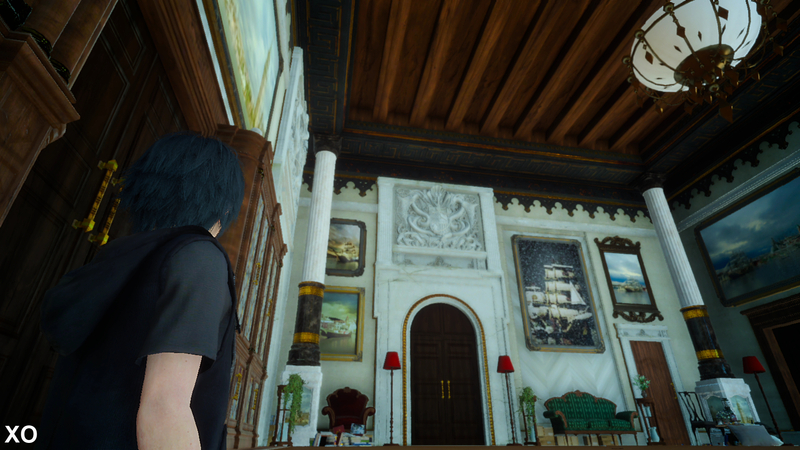 As a result, PS4 can at times look far cleaner than it did in Episode Duscae. We get a sharper 1080p presentation at points, while at others it's a slightly rougher image. 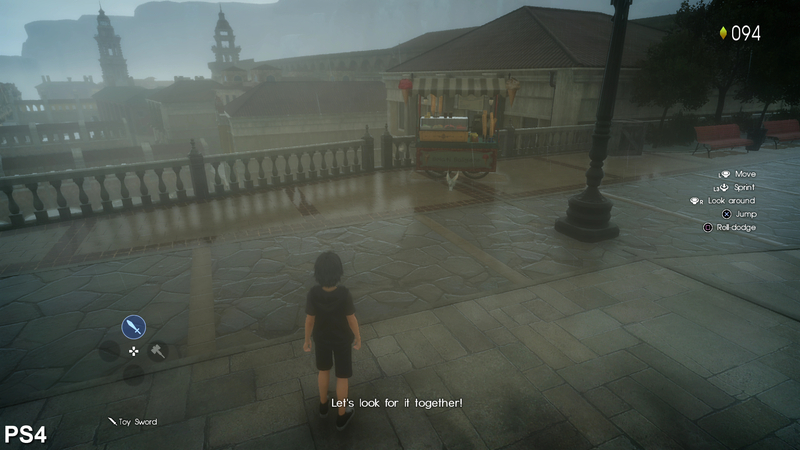 On balance we're still usually looking at a 900p picture in Final Fantasy 15 for much of the duration, but there's now some leeway to either side of that figure. This logic also applies to Xbox One with its middle-ground 1408x792 native resolution. In reducing its rendering load to a theoretical minimum, 1568 x 882 is Xbox One's highest resolution in this demo, while its lowest point is just 1360 x 768. In other words, Xbox One always runs at a lower pixel output than PS4 and it translates to a perceptibly clearer image for the latter, in the main. However, image quality takes a hit due to the aggressive in-house post-process anti-aliasing, causing the image to blur on each console regardless of resolution in use. 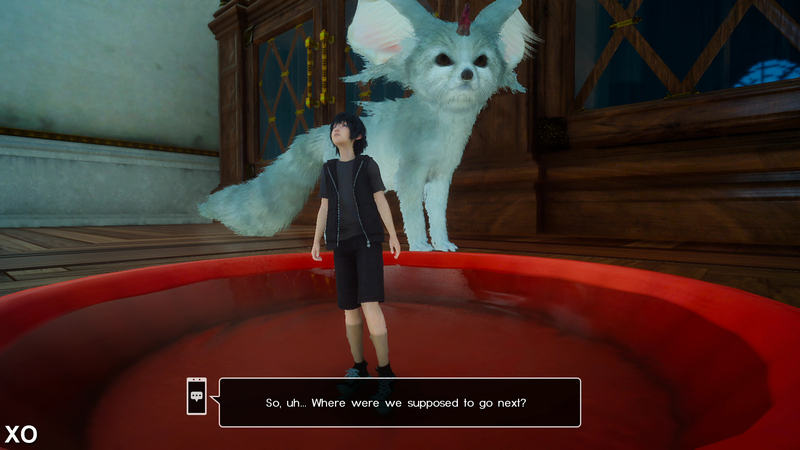 Coverage is also spotty, particular on Noctis and Carbuncle's hair, and high contrast elements can flare up in aliasing for a few frames before returning to a blurred state. 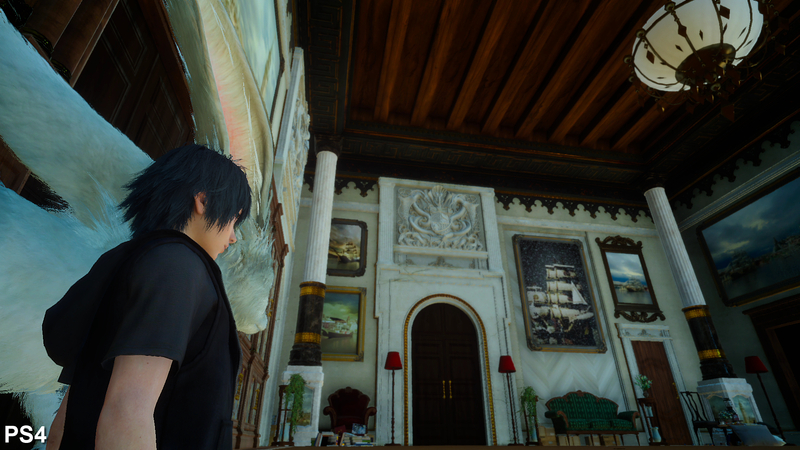 For the second demo running, Final Fantasy 15 is let down by a post-process image treatment that's inadequate for the subject matter at hand, and it distracts from the great visuals at its core. A dynamic resolution is in place on each console, though PS4's pixel output is typically higher than Xbox One's. 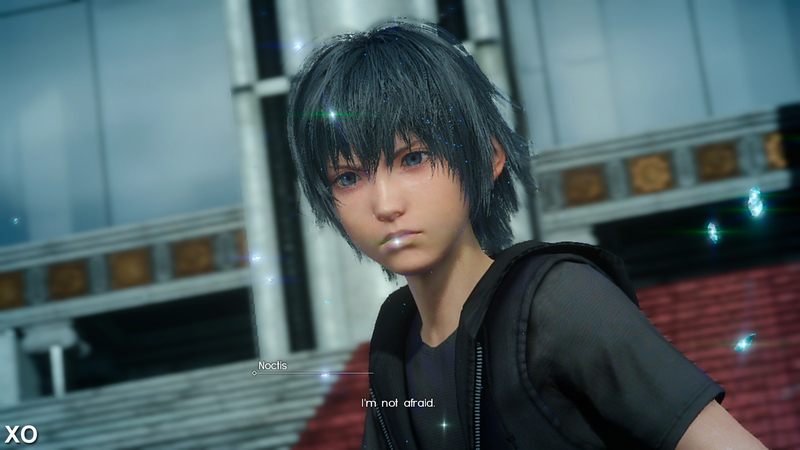 On transparent elements such as Noctis' hair, this equates to more flickering. 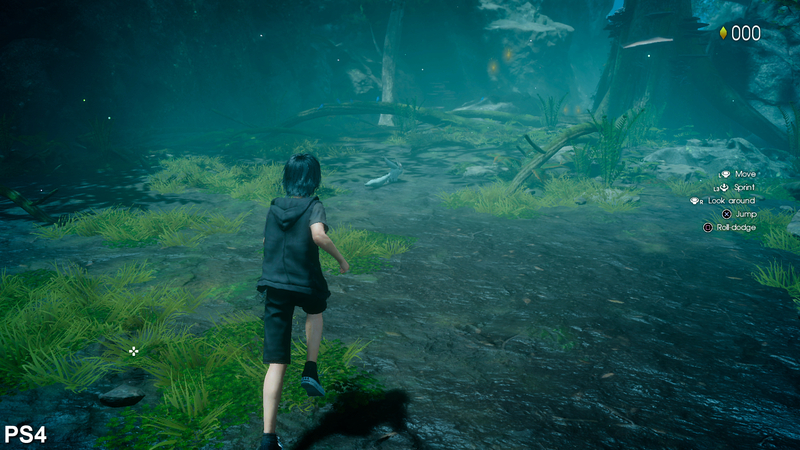 It's a similar story for the demo's environments, with a softer image around this woodland on Microsoft's machine. PS4 tends to run at 900p here, while in the main, Xbox One holds at 792p (though each fluctuates above and blow these figures). Textures, geometry and lighting are an exact match. There is a difference in GPU-accelerated particle effects that favours PS4 when jumping on switches - but battle and item effects are identical. Once again, blending on alpha transparencies such as hair tends to be a weak point in image quality - just as it was in Final Fantasy 13. Each environment is beautifully lit and decorated, making the most of the dynamic time-of-day and weather. 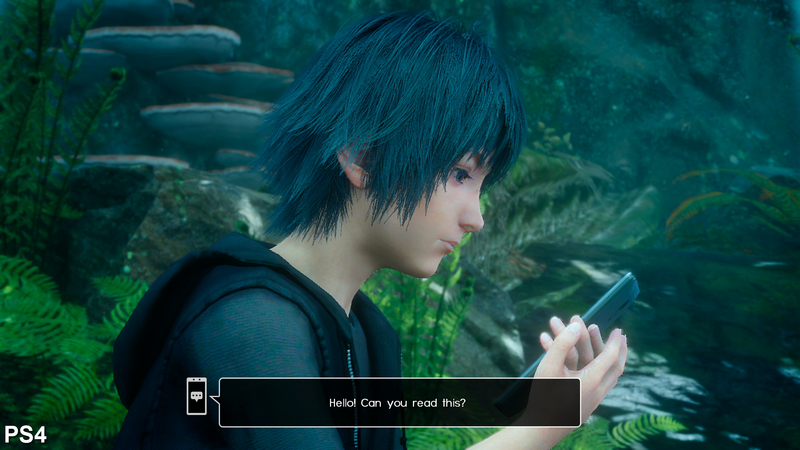 The demo's depth of field effects can produce a filtered effect on foreground objects, as noted on Noctis' hair during cut-scenes. We had hoped a shift to a dynamic resolution might address the game's frame-rate issues. On PS4 and Xbox One we saw sub-30fps dips aplenty in Episode Duscae - and this is sadly still true of the Platinum demo. 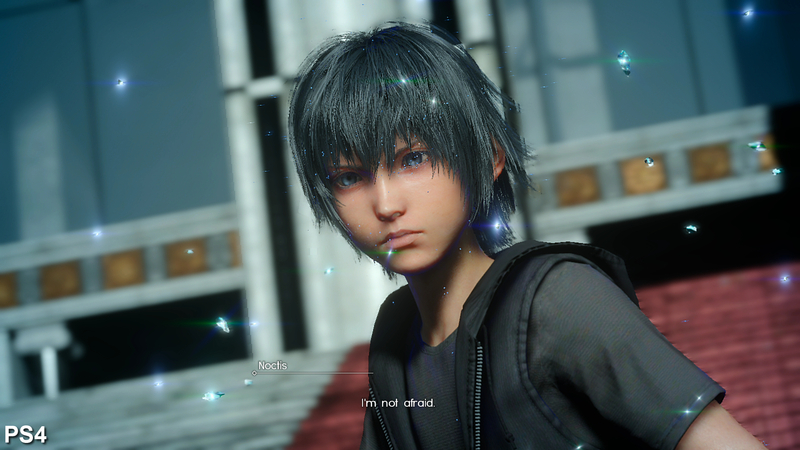 Once again PS4 leads the charge by a margin of 5fps in matching stress-tests, where close-ups on Noctis see the engine struggling on each format. However, prolonged drops to 20fps (and a low of 15fps on each) are in evidence during the final boss battle on PS4 and Xbox One. Alpha effects are the expected culprit in battle, which is at odds with the rapid pace of its combat. 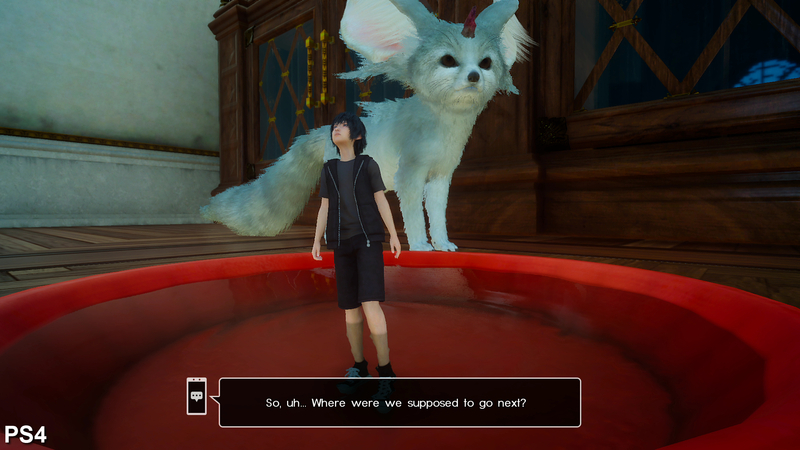 With six months to go until Final Fantasy 15's launch, there's still time to tinker, but given we've seen little change since the last demo, it is a growing concern. The bad news continues. While PS4 offers a clear frame-rate advantage in cut-scenes, Sony's machine has a unique problem in frame-pacing not found on Xbox One. Similar to Bloodborne, a faulty 30fps cap causes PS4 to render in new frames at irregular intervals, causing its frame-time to switch erratically between 16 and 50ms. As ever, this creates the perception of stutter where there should be none - a frustrating bug, and one that means Xbox One plays out more fluidly when it hits its target 30fps cap. Caught in a development quagmire since 2006, both its intended format and core engine have shifted in the interim - a stop-start process that can't have done it any favours. Parts of the tech shown so far are excellent; the dynamic lighting, weather simulation, the vast explorable areas, and even its hair and foliage physics. The final product is bound to impress on the basis of this demo, but questions on frame-rate and image quality still need a firm answer.